The Jade Bay [Jadebusen], an old estuary of the Weser, was chosen by Prussia in 1853 as a naval station. 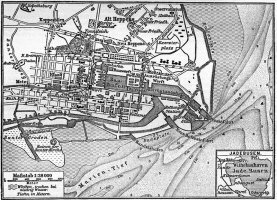 Wilhelmshaven grew up amid hard struggles with deceitful marsh fevers, storm-floods, and the continual silting up of the entrance to the harbour, which, while unapproachable for enemies, was not free from danger to its own ships. To commerce the place can never be of much importance, as there is no waterway from the interior to the bay. In this respect the Dollart, an opening made farther west by similar incursions of the sea into the coast of Friesland, is greatly superior to the Jade bay. 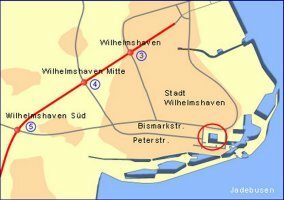 Wilhelmshaven comprises a tract of land near the mouth of the river, purchased from Oldenburg by Prussia in 1853. It was an extensive naval station. By an elaborate engineering system, including a canal and docks walled with granite, wharves, and extensive basins, the whole system being strongly fortified, this had been made one of the best defended and most important European stations. To dig out an enemy thus made secure in shelters had the look of a forlorn hope. He could not be dug out unless he was really ready to fight, for he could withdraw from North Sea waters through the Kiel Canal and so into the Baltic. 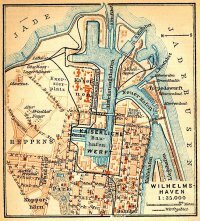 The year 1852 brought an event of the utmost importance for the development of the Prussian Navy - the acquisition of Wilhelmshaven as a North Sea base. At that time Prussia did not possess an inch of coast-line on the North Sea, and could obtain access to it only through the Belt and the Sound, then under the control of the superior naval power of Denmark. Among the innumerable projects with which the National Assembly had been deluged, was the scheme of three citizens of Rendsburg for the construction of a water-way pretty much along the line subsequently followed by the Kaiser Wilhelm Canal. This plan was, however, based on the false assumption that Schleswig-Holstein would at once become, and ever afterwards remain, German territory. It had also been proposed to the Frankfort Government by an Oldenburg official that the Jade Bay should be chosen as the North Sea base for the fleet, and this suggestion seems to have fixed the attention of Prince Adalbert on the inlet which was latr the chief naval headquarters of the German Empire. The Grand Duke of Oldenburg was approached, and he consented to cede to Prussia the piece of marshy land which has since been covered by the harbors, docks, shipyards, workshops, barracks, and fortifications of Wilhelmshaven. Prussia paid a sum of 500,000 thalers for this invaluable possession, and at the same time took upon herself the protection of the coast and sea-trade of the duchy. Herculean efforts and inexhaustible patience were required to adapt Prussia's acquisition on the Jade to its destined purposes. Years had to be spent in a careful survey of the bed of the harbour, in order to ascertain how far the channel was affected by the movements of sand and mud under the influence of the tide. Further years were consumed by the task of sinking piles in the treacherous peaty soil to obtain a solid foundation for dock and harbour walls. Frequently a storm or a spring tide destroyed in a few hours the fruits of months of strenuous labour. 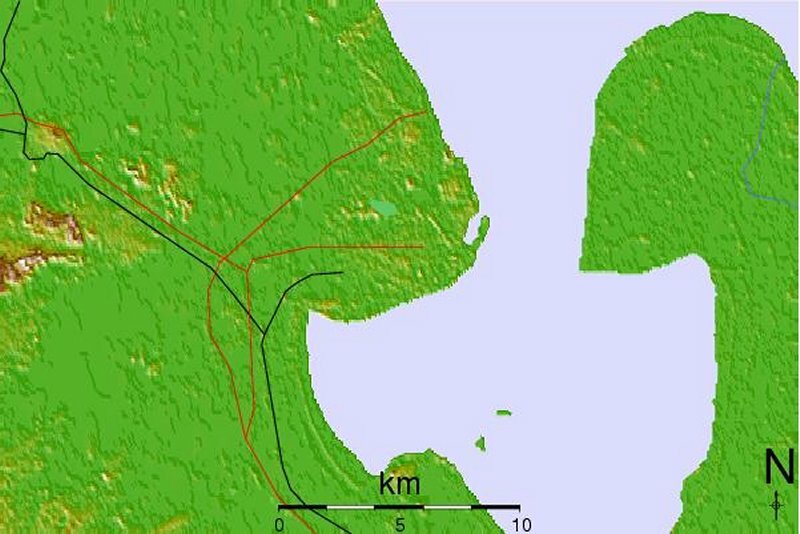 As Hanover refused to allow the construction of a railway across her territory, which lay between Prussia and Oldenburg, it was necessary to convey all the building materials to the spot by the long and tedious sea-route. At first not even drinking-water was to be had on the desolate site, and prolonged and costly exertions were needful before it could be procured in sufficient quantities. 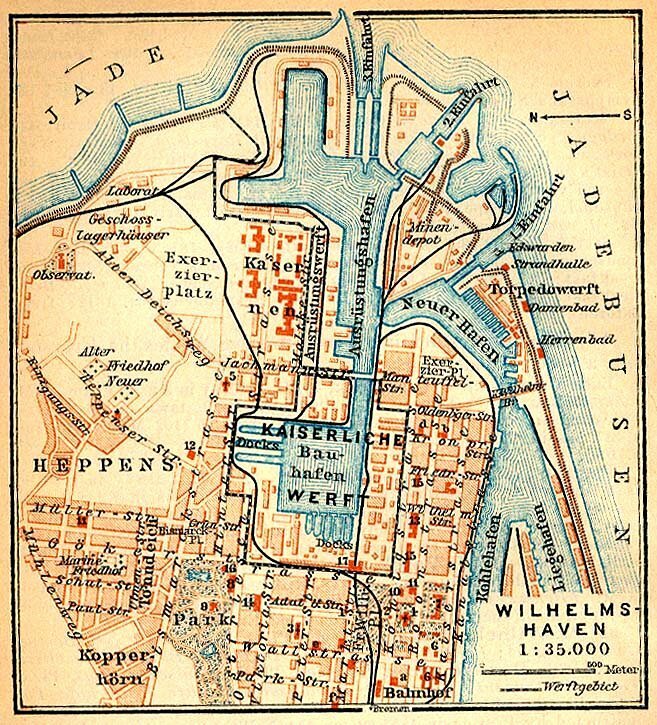 Sixteen years elapsed before the new harbor was formerly declared open by the Prussian King in person, June 17, 1869, afterwards the Emperor William I., in the presence of British ships, the officers of which probably regarded the works with indulgent curiosity, and little guessed the significance which Wilhelmshaven would one day possess for their own country. No less a sum than three millions sterling had been spent in that period, exclusive of the fortifications. The yard had been planned on a generous scale, and subsequent extensions have made it one of the largest and best equipped naval establishments in the world. It covered an area almost four times as great as that of the sister yard at Kiel. Between 1908 and 1912 various improvements were carried out at the cost of one and a half millions. They included the construction of a new entrance to the yard and of additional building-slips, workshops, and general plant. At the same time, the fortifications were brought up to date and extended. In 1914, the yard contained four building-slips, seven dry and six floating docks, and power-driven plant, with an aggregate horse-power of 7500 units. The staff numbered 11,000, of whom 36 were officers. Wilhelmshaven was the headquarters of the North Sea station, and had both a governor and a commandant. It was the home base for the first and third battle squadrons, the cruiser squadron, four destroyer flotillas, and the first submarine division. The Jade was far from being an ideal situation for a first-class base. The fairway, 14 miles in length, had to be dredged continuously to keep it from silting up. On this work two dredgers, each with a capacity of 5000 cubic meters per hour, were employed without intermission. Furthermore, the abnormal rise and fall of the tide made it essential to devise an elaborate system of locks, through which warships of heavy draft could enter and leave the port at all times. One advantage of this is that it rendered the dockyard and the ships stationed there absolutely safe from enemy torpedo craft or from submarines. On the other hand, a good deal of time was taken up in operating the sluices when ships are passing in and out, and for a whole squadron to pass through the locks would be a matter of many hours. The port was defended by batteries along the western shore of the Jade, so placed as to sweep the very narrow fairway. The heavy guns, said to be of 9.4-inch and 8-inch caliber, were in armored cupolas, the position of which was invisible from the sea. There was also a shore torpedo station and a mine depot. The approach to the Jade was commanded by the Wangeroog, the easternmost island of the East Frisian group, which lies twenty miles north of the base. Apparently the strategical importance of this place was not always recognized, for it was only in 1910 or 1911 that steps were taken to fortify it. Very powerful guns were mounted there, and the garrison in peace numbered five companies of the second Matrosen-Artillerie division, a figure which conveyed some hint of the strength of the defenses, for the garrison maintained at Heligoland numbered only four companies. The conversion of the Wangeroog into a heavily armed fortress not only rendered the prospect of a coup de main against Wilhelmshaven very remote, but practically removed all danger of the dockyard being exposed to long-range bombardment. Long before hostile ships could approach within range of the port they would come under the fire of the Wangeroog batteries. Germany's principal base on the North Sea was thus well secured against a naval attack. To each of the two Naval ports of Kiel and Wilhelinshaven a Vice-Admiral was appointed as "Marine Stationschef " (Commander-in-Chief of the Station) for the Baltic and for the North Sea respectively. These Admirals were also in command of the Naval port district, Com- including the forts. All the vessels, dockyards, and Naval resources within the jurisdiction of the station are under their authority, excepting the vessels of the " First Squadron." 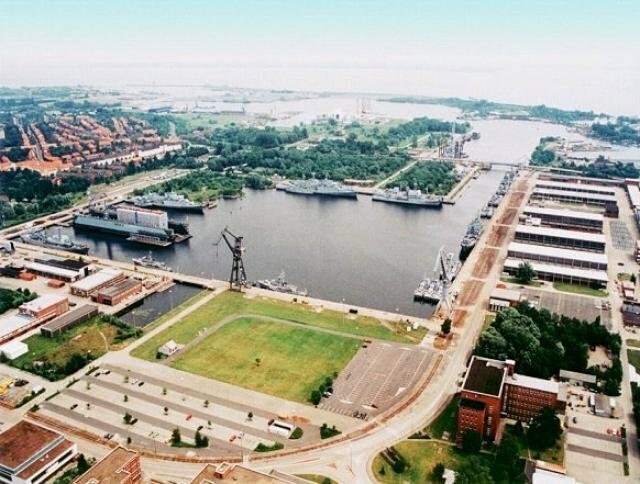 The German Navy had three dockyards - at Wilhelmshaven, Kiel and Danzig. The last named was of minor importance, at least as a fitting-out yard. The dockyard superintendent (Oberwerst Director) was a Rear-Admiral or captain, and is directly subordinate to the Secretary of State. Under the supervision of the superintendent there were the following heads of departments : - The outfitting director (captain of the Fleet Reserve), the director of ordnance, the director of torpedoes and the director of navigation (staff captain). They are all either captains or commanders, the two last being Naval officers (zur Disposition). Besides these, there were a director of construction (chief constructor), director of engine building (chief engineer), a director of works, and an administrative director, all of whom were superior officials, and are of equal rank. The departments in charge of these officers had the requisite offices, business premises, workshops, assistants, and staff ; while the superintendent of the dockyard had his own office, which was managed by a commander acting as his assistant, who had also the control of the dockyard police and fire-brigade. The superintendent of the dockyard had a lieutenant as his adjutant. Jade [JA'DE, or JAH'DE] was the name of a river, bay and territory, in Prussia (Oldenburg), on the North sea, immediately west of the mouth of the Weser. The river is navigable; it drains the district of Oldenburg, and emplies into Jade bay. The bay originated in an y storm floods that occurred in 1219 and 1511; when the sea, driven by a violent tempest, overflowed the land, covering a tract 74 square miles in extent. The territory of the same name covered one and one-third sq.m. : pop. '71, 3.789; and since 1873 had been incorporated into Hanover. The sands at the entrance as well as in the Jade and Weser are constantly changing. The channels are buoyed in accordance with t-he German uniform system, and the buoys are shifted as necessary, so that the directions given should be used with caution, and no stranger should enter the river without a pilot. Gas buoys were used in certain places for night navigation. 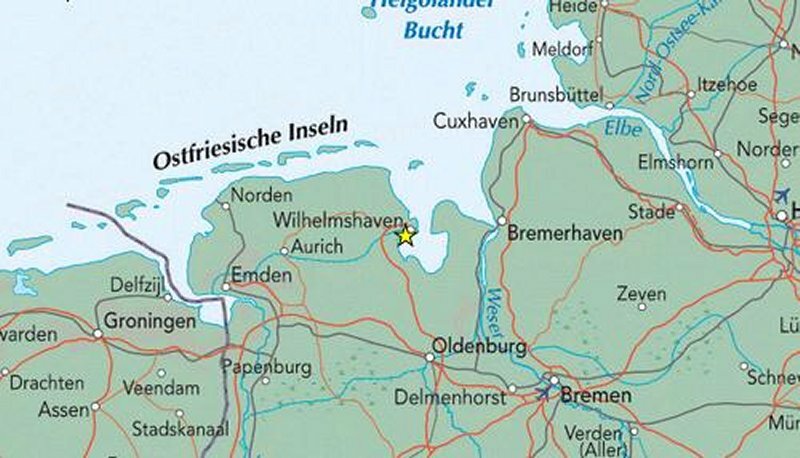 The mouths of the Jade and Weser are bounded to the westward by Wangeroog, a low, sandy island and the easternmost of the East Frisian Islands. It is about 5 miles in length by 3/4 mile in breadth. The northern shore is protected against the action of the sea by a number of stone groins. A village formerly stood upon the west extremity of the island, and the tower of its church, 177 feet high, still standing, but surrounded by water at high tides, is one of the most prominent objects upon the coast; but the village has gone. Two middle grounds or sands, of which Jade Plate is the westernmost, separate the mouth of the Jade from that of the Weser. The western side of the channel of the Jade is formed by the projection of the sands eastward, dry at low water, between Wangeroog Island and Schillighorn on the main, named Minsener Old Oog and Neue Brack ; near the edge of the former of which are two rescue beacons. Southward of Schillighorn the channel is confined between flats fronting the west shore, and Alte Mellum and Hohe Weg flats and Solthorner Watt, the two former of which extend about 13 miles northward of Butjadingen, eastward of which is the Weser. Projecting from the flats on the west side of the river are H Plate, a shallow flat between the Minsener Old Oog and the Minsener channel ; the Voslapp Plate, a long spit, dry at low water, which extends northward from abreast Voslapp to abreast Hooksiel; and the Heppenser Plate, with but little water on it. Just above Wilhelmshaven the shores of the Jade recede and form Jade Bay, a shallow circular basin about 9 miles wide ; the source of the river is near Rastedt, 15 miles above it. The whole length of the Jade may be assumed as 50 miles. In the Jade the formation and the disappearance of ice is very uncertain. The channel of the Jade never freezes completely over, and there have been years when there was no ice. As a rule, the first appearance of ice is from the end of November to the middle of December, and no ice is expected to be in the river after March 1. In general, it may be said that the ice in the Jade does not necessitate a closing of its navigation for any length of time.